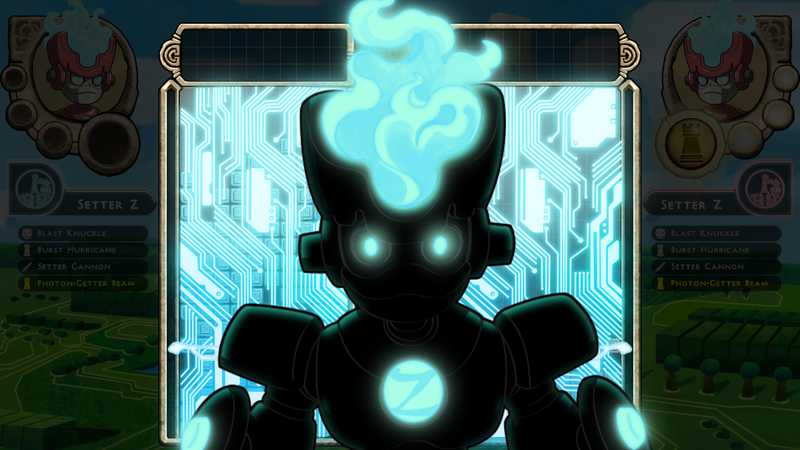 A mysterious machine of science, Setter Z has weapons everywhere, attacking his opponents in various ways. His play style consists of frequent usage of his moves to attack and throw his opponent off. He has moves to slow down the opponent, set his board up for huge line clears, and a move to disorient the opponent. Setter Z has 1 Hindrance type skill, 2 Technicals, and 1 Attack skill. With the lack of a true Defensive skill, Setter Z is designed to be played aggressively by pummeling his opponent with offense. Setter’s first skill shoots his fist of justice in the air to constantly push against the opponent’s active piece. During this time, the opponent will be unable to press drop or increase the drop speed of their piece. This is a very useful skill for controlling the pace of the match, since the opponent cannot increase their drop speed, you will be able to dictate which piece you want next, and what piece you want your opponent to acquire. Setter opens his mask and blows a fierce wind against his board, blowing all the pieces to one side. This is a very powerful move as it can become a very effective attack when set up properly if the next piece is a long piece. Setter transforms his arm into a cannon and shoots an electro-magnetic ball at the opponent’s board. The opponent then becomes paralyzed such that they will be unable to rotate until the effect wears off. This is Setter’s main attack to disrupt the opponent’s board. Setter’s eyes transmits laser beams at the opponent’s board and copies it unto his board. This is mainly a defensive move when the opponent is in a better situation, but can be self-destructing if not. Use carefully.